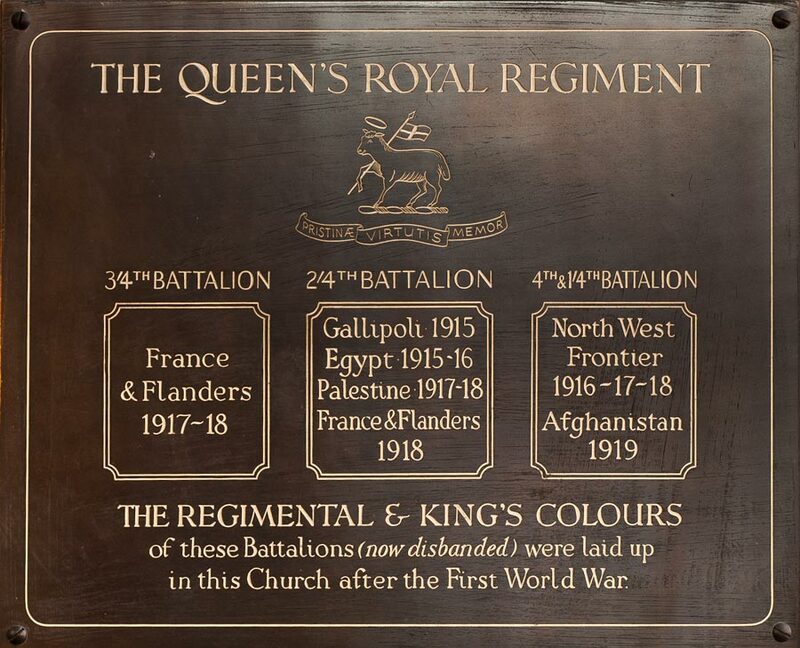 On the formation of the Territorial Force in 1909, the 1st Volunteer Battalion of The Queen’s became the 4th Battalion (TF) and as such became eligible to display Colours. In fact this battalion was the very first TF unit to be granted permission to carry Colours. 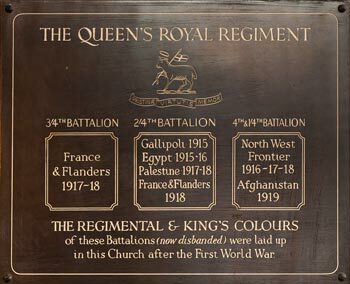 Because of this there was a good deal of discussion over design and it is from these Colours that one can trace the direct descent of those Colours afterwards carried by the Regular and Territorial Battalions of the Regiment. The King’s Colour was identical to that of the 1st Battalion later presented in 1947 which has already been described in this series, except that it bore a Roman numeral IV in the first canton. 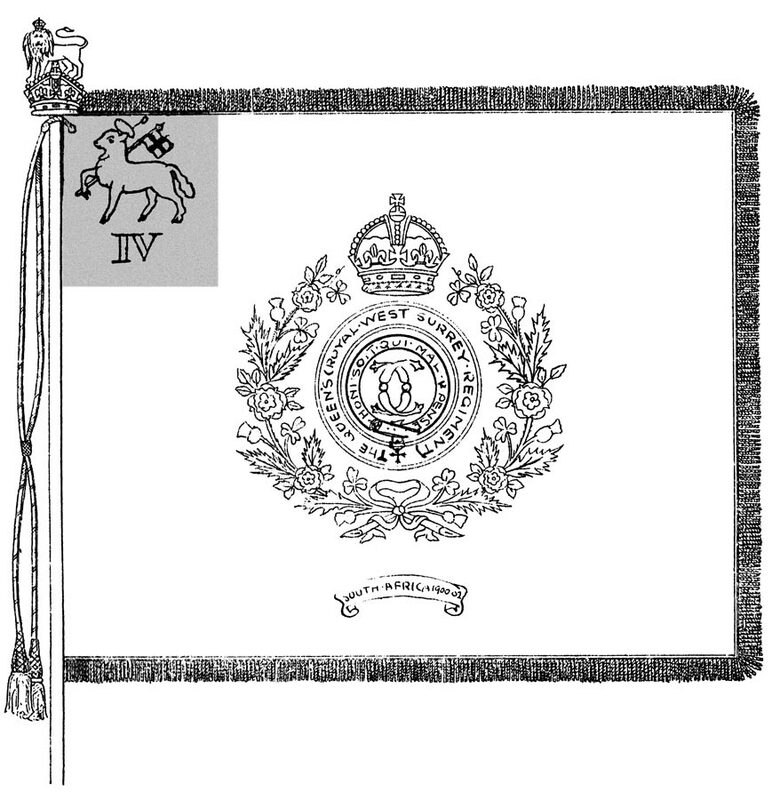 The Regimental Colour was a blue sheet with four paschal lamb corner badges, each with the motto Pristinae Virtutis Memor, and again a Roman IV in the first canton. The centre roundel was originally to bear the cipher of HM Queen Alexandra, following usual precedent, but King Edward VII decided that it should bear his own royal cipher. The then Commanding Officer of the Battalion, Colonel FD (later Sir Frank) Watney, at the instigation of Mr Farnham Burke, Somerset Herald and Inspector of Colours, pointed out to His Majesty that the Regiment had never borne a King’s cipher. The Colour design was therefore approved on 2nd November 1908 without any cipher, and were duly made by Messrs Hobson and Sons at a cost of £47/10/- In August 1909 the battalion was in camp at Arundel, where the King agreed to present the Colours – an engagement which he was later obliged to break owing to a visit by the Tsar of Russia, however His Majesty agreed that the interwoven Cs of Queen Catherine might be borne in the centre of the Colour. After due consultation with the Colonel of the Regiment, General Kelly-Kenny, and with the agreement of the two regular battalions, this cipher was adopted and later became the standard design. The usual union wreath surrounded the centre but only bore one battle honour: SOUTH AFRICA 1900-1902. 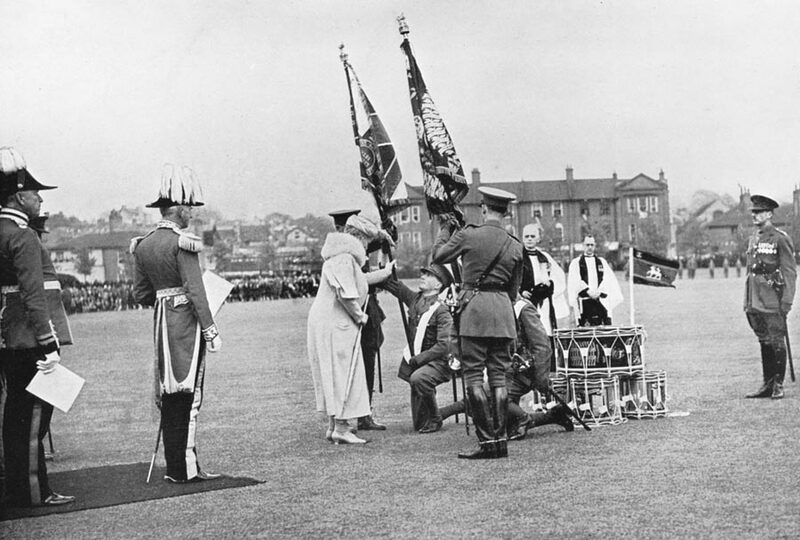 The Colours themselves were presented by Field Marshal Earl Roberts at Duppas Hill, Croydon, on 10th July 1910. The original drawings of these Colours were preserved by D Company 6th/7th QUEEN’S (V) at Sutton, and later passed to the Regimental Museum. After the Great War, TF Battalions were granted the privilege of bearing the same battle honours as Regular battalions. The King’s Colour was therefore emblazoned with the same ten battle honours as the 1st and 2nd Battalions; a golden laurel wreath was added to the Regimental Colour bearing the battle honours won outside the Great War. These Colours remained in service until 1938 when New Colours were presented to the battalion by HM Queen Mary, Colonel-in-Chief of the Regiment, at Whitgift School, Croydon, on 7th May 1938. These Colours followed the same design as the old. The old Colours were then laid up in Croydon Parish Church on 8th October 1938. Shortly after this, the Battalion was converted into an artillery regiment, so that those honours awarded to the Regiment during the Second World War were not added to the King’s Colour even though the colours were retained by the unit until it was amalgamated with the 5th and 6th Queen’s in 1961. After this, the Colours were laid up at Croydon on 5th April 1964. Before leaving the 4th Battalion it should be noted the Croydon ACF unit carried a pair of Banners similar to Colours for many years. 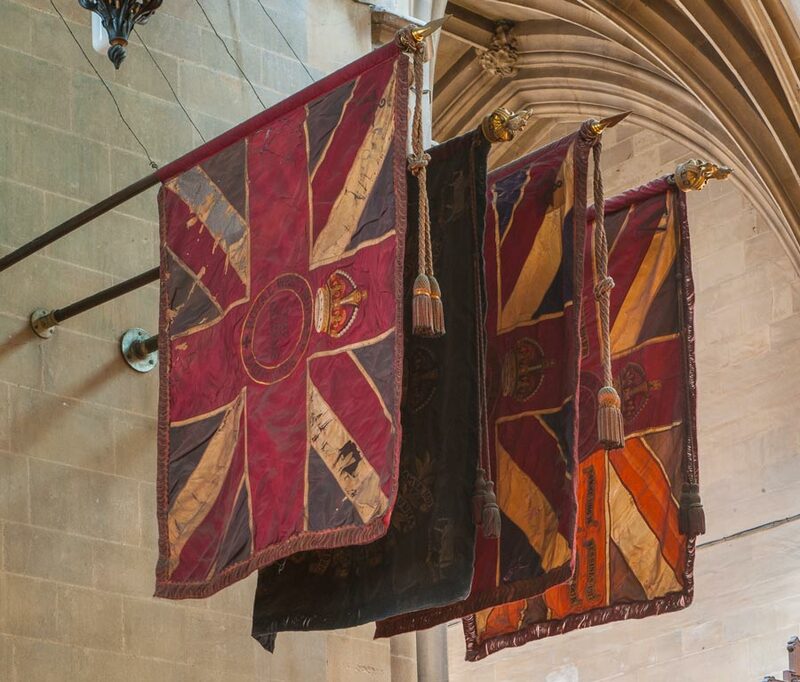 The old Banners have been laid up alongside the 4th Queen’s Colours.